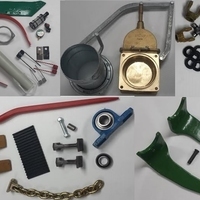 It is very important that our customers have the best experience using our website whether they are buying tractor parts, agricultural spare parts or machinery. Our goal is to make sure that every customer is 100% satisfied with their purchase. If you are not completely satisfied we want to address your queries immediately. Below are some of the reasons to shop online at DH Farm Machinery. *We have knowledgeable staff. Can't find what your looking for online? Call us in store or email us and one of our highly trained staff will be glad to help you. We have real people answering your questions. *We offer top quality products at competitive prices.